Oil on canvas, 18,5 x 27 cm. Ernst Meyer had a distinct talent for painting the Southern way of life with a special warmth and insight. 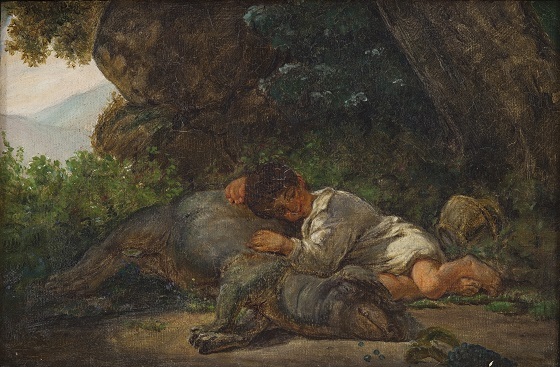 In this painting set in a forest glade, an Italian boy trustingly leans up against a black hog while taking a midday nap. They are surrounded by lush vegetation, and a distant mountain landscape can be glimpsed on the left. The idyllic and tranquil atmosphere that marks the surrounding nature is reflected in the close bond of trust that exists between the boy and the hog. Unlike the artist’s oil paintings, a watercolour painting such as this one is characterised by its warmer shades as well as a lighter colour scheme.